USB Whack-It Not Nearly Violent Enough | OhGizmo! Don’t get me wrong, I love useless USB accessories just as much as the next guy, assuming the next guy absolutely hates useless USB accessories, and this USB Whack-It is one of the more useless I’ve seen. I’m not saying that I can’t appreciate a good, violent game of Whac-A-Mole. Quite the contrary: this is a terrible, pointless whack game precisely because you don’t get to whack anything with a giant hammer, which is the whole point of the game… Sheer mindless satisfying violence against things that are smaller and weaker than you. 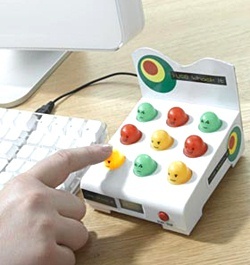 In this USB version of the game, all you do is bop your finger against the hairless multicolored plastic “moles” when they light up, and where’s the fun in that? Bring on the huge black squishy mallet and maybe, just maybe, I’d consider paying $20 and a USB port for one of these.